You know what’s better than Sugarfina Champagne Gummy Bears? Champagne soaked gummy bears! Contrary to their name, Sugarfina’s delicious gummy candy doesn’t actually contain any alcohol. After seeing The Skinny Fork’s pin on Pinterest, I wanted to whip up a batch of champagne soaked gummy bears for New Year’s. However, with all our traveling, I just couldn’t pull it (or myself) together. So, I waited and made some for Kyle’s homecoming from Phoenix, and they’re so darn yummy! 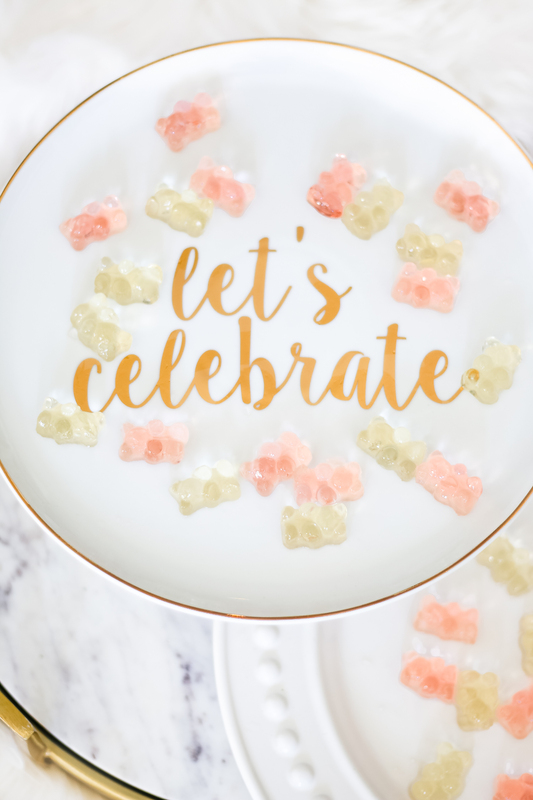 With February 14th being around the corner, these delicious champagne soaked gummy bears are the perfect alcoholic snack for Galentine’s parties, Valentine’s dates, and everything in between. Oh, and the recipe is ridiculously easy! I used Sugarfina Champagne Bears Gummy Candy, since it’s my absolute favorite. I feature them on just about every gift guide I make. I’ll admit, though, that they’re also a pretty darn pricey (and unnecessary) indulgence. Feel free to substitute more affordable gummy bears. 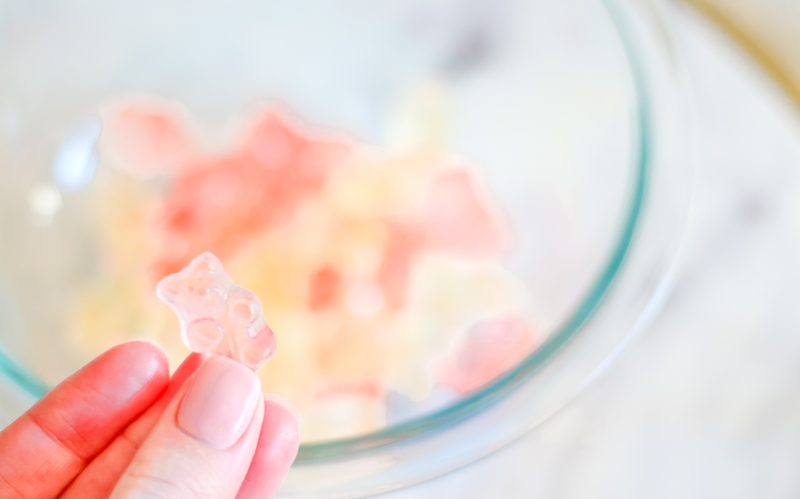 Keep reading for the full recipe and photo tutorial for how to make champagne gummy bears! There’s also a recipe card below that you can save/share/print for safe keeping. These delicious, 2-step champagne soaked gummy bears will be a guaranteed hit at your next party! Place desired amount of Sugarfina Champge Gummy Bears in a bowl. Pour 1-1.5 cups of dry champagne over the gummy bears. It should be just enough to clearly cover all the gummy bears. Cover bowl with lid or saran wrap. Refrigerate for a minimum of 14 hours. 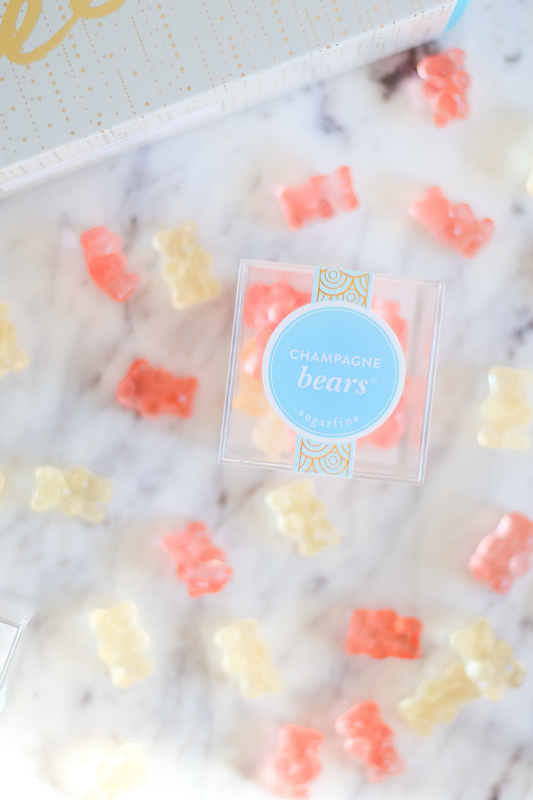 You do not need to use Sugarfina candy to make a delicious batch of champagne soaked gummy bears! Any tasty gummy bears will suffice. If you’re every looking for a good bottle of budget bubbly, Trader Joe’s Blanc de Blancs is my favorite! It costs between $4.99-6.99, depending on where you live. It’s perfect for mimosas and other champagne cocktails. Our nearest Trader Joe’s is in St. Louis, so Kyle and I buy this stuff by the case! After the gummy bears have soaked for a minimum of 14 hours, they’ll look like this (below). Although they’re slippery, most will hold their cute little bear shape! When you’re ready to serve, drain the remaining champagne for the bowl. Place champagne soaked gummy bears on a serving tray or in a clean bowl. They’re still pretty darn fruity, which I love. The best way to describe the taste would be a light mimosa in gel form. Cake stands work great for presentation, as well! You can find my cute Let’s Celebrate cake stand on sale for $32 here. Enjoy responsibly! They pack quite a bit of punch. If you love champagne cocktails, you’ll also love this delicious Raspberry Champagne Float! It’s another perfect alcoholic treat for Valentine’s and Galentine’s festivities!